The main features of desert soil that affect water and nutrient availability include texture, content of organic matter, pH, and orientation within the landscape. Desert soils show typically little development from parent material and some authors even state that typical developed soils do not exist in deserts. Most desert soils are classified as Aridisols and are differentiated into soils with a clay (argilic) horizon (Argids) and soils without such horizons (Orthids). Other soils, less common in deserts, are molli-sols, soils with dark A horizons, and Vertisols, cracking clay soils. Accumulated subsurface horizons with either clays or calcium carbonate (calcic horizons) have clear implication as impediments to water infiltration. Most desert soils tend to be slightly to highly basic. 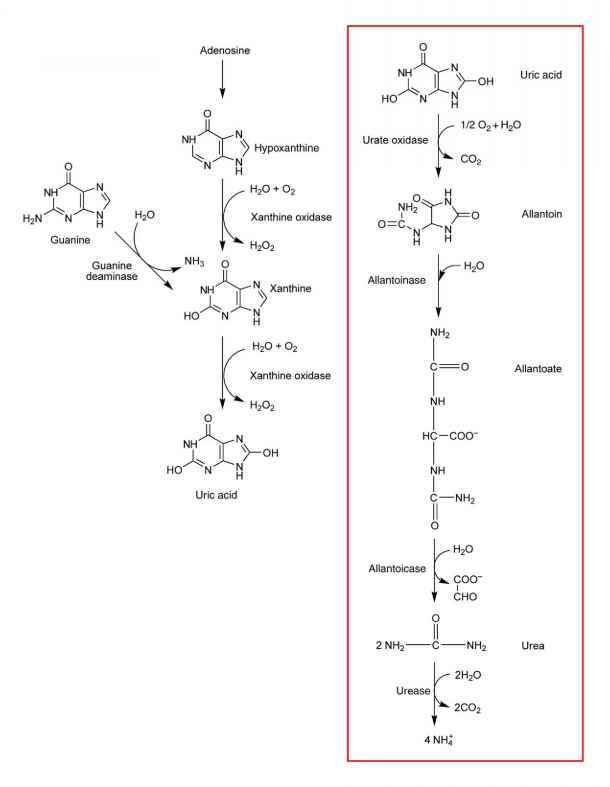 Such reactivity can negatively affect phosphorous and micronutrient availability as these are generally not in solution at pH > 7.0. Organic matter helps to increase infiltration and via decomposition adds to nutrient availability. It is often distributed unevenly in desert soils (see below). Soils in deserts have important effects on water inputs as they act as short-term water stores and modify water availability by a number of regulation processes. These regulation processes include direct infiltration and often more importantly runoff and horizontal redistribution of water. Redistribution by runoff tends to be of crucial importance in deserts and contributes to spatially very patchy distribution of water. Relatively impermeable surfaces (e.g., biotic or physical crust in clay-rich soils) create runoff areas that result in catchments that are water rich. Such water redistribution enables patchy plant production even in extreme arid zones, where plant growth would not be possible since evenly distributed sparse rainfalls would not exceed the threshold needed for plant life. Because of sparse plant growth, soil-created redistribution of water is more important than precipitation interception through plant surfaces. However, locally such interception combined with stem flow can create water-rich spots under shrub or tree canopies. In contrast, smaller precipitation events can be locally intercepted and lost by evaporation. This is the reason that soils in the understory of desert shrubs or trees can be either wetter or dryer than the surrounding soil. Figure 9 Marked phenological and plant composition differences due to slope exposition (southeast facing slope on the left and northwest facing slope on the right). 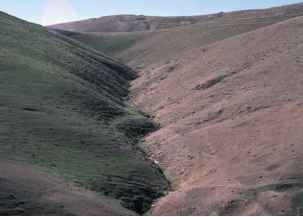 The southeast-facing slope is subject to higher evaporational water losses and receives less direct rainfall compared to the northwest-facing slope. Such abiotic differences result in clear biotic contrast in arid environments, making these systems ecological model cases. Judean Desert, Palestine, December 1989. Photograph by C. Holzapfel. fine-textured soils are commonly considered to be superior for plant production, this is called the 'inverse texture effect'. Clearly, the orientation and dynamics of soil surfaces within the landscape plays a large role in arid ecosystems. Exposed southern (or northern, depending on the hemisphere) slopes receive high solar radiation and therefore due to higher evapotranspiration, tend to be drier than opposite slopes (Figure 9). These inclination differences are observable on large-scale landscape level or small-scale microtopography level. An example is the sun-exposed sides of shrub hummocks that are often only raised by a few centimeters, but can be bioclimati-cally and ecologically very different from the less-exposed side. Slope exposition also plays a role when rainfall directions due to prevailing winds are constant. Rain-exposed slopes can receive up to 80% more water than other slopes.